They say April showers bring May flowers, but in the classroom, they also bring plenty of excitement about the close of the school year. 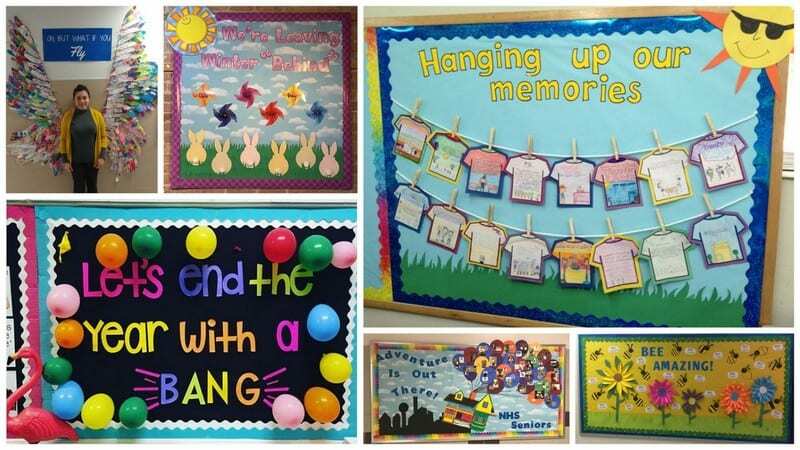 Try these spring and end-of-year bulletin boards to keep students engaged in learning until the very last day. 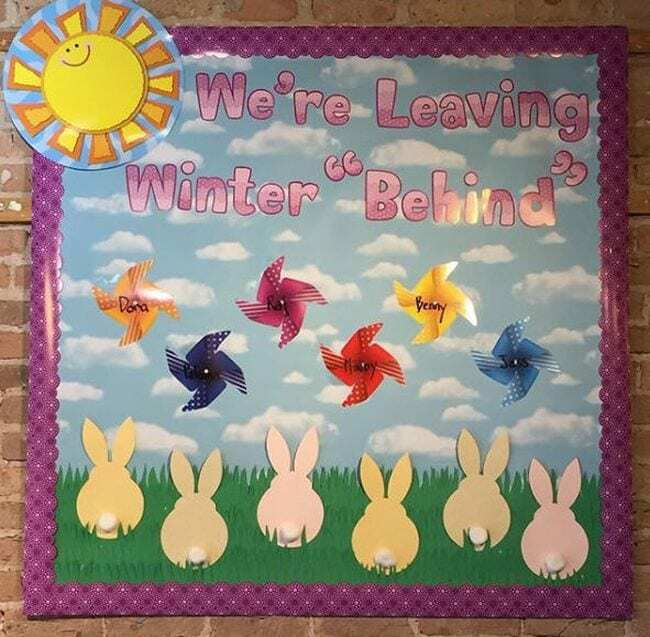 Kids will get a giggle out of this punny bunny spring bulletin board. Feeling ambitious? 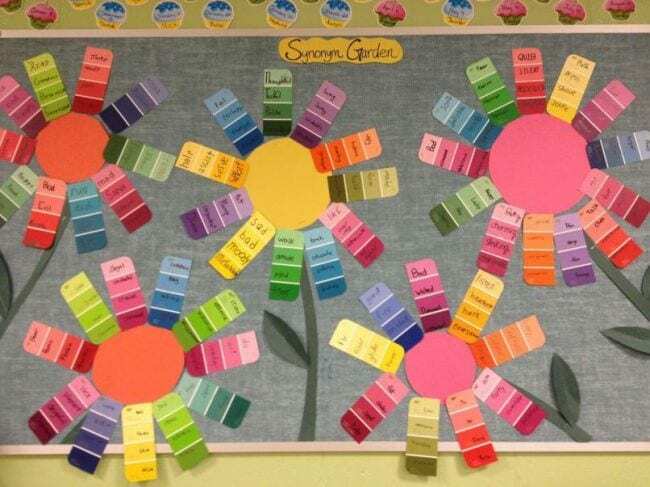 Have kids make real working pinwheels to attach to the board. 2. Hang up some memories. Give each student a paper T-shirt cutout to decorate and fill with their favorite school year memories. 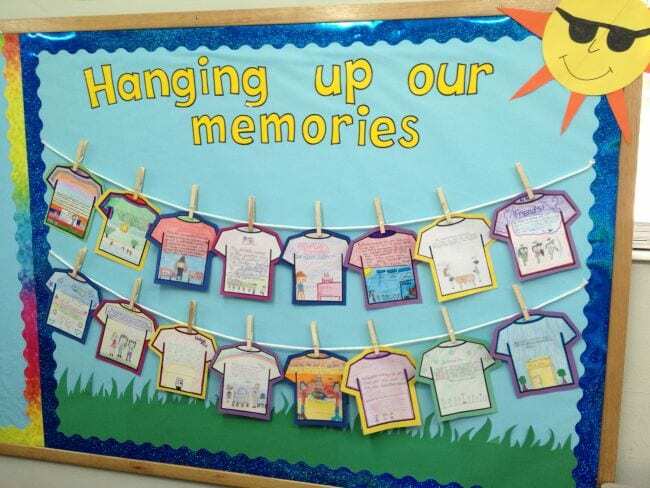 Then hang them up for all to admire on this end-of-year bulletin board. 3. Enjoy the showers and flowers. Use watercolors or crayons to decorate umbrellas, then hang them over paper raincoats featuring your students’ names. 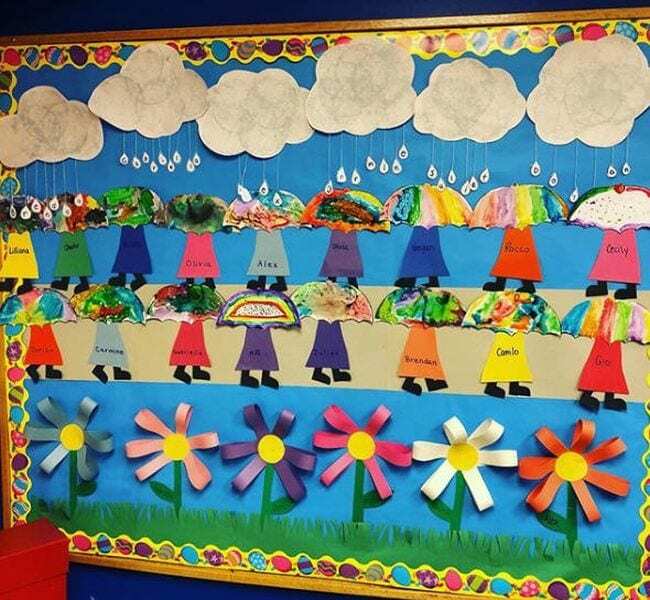 Words or names fall from the clouds in raindrops, while those 3-D flowers are simple enough for any teacher to create. 4. Plan your summer bucket lists. 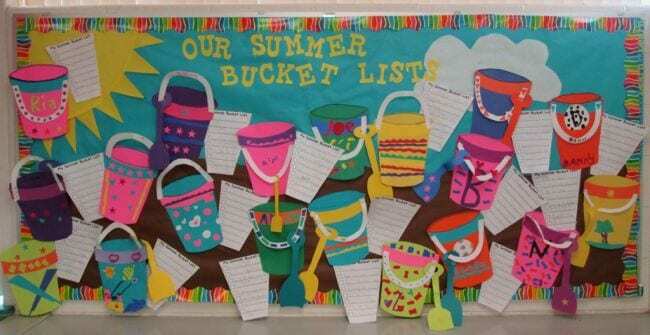 Bucket lists are a popular end-of-year bulletin board idea, and it’s easy to see why. Hit the link below for free printable templates, then have kids create colorful buckets and a list of what they want to do over the summer. 5. Create a synonym garden. Using paint sample strips to list synonyms is downright genius. And posting them as beautiful flowers is the frosting on the cake! 6. Fill pockets full of memories. Reflecting on the year is a nice way to wrap things up. 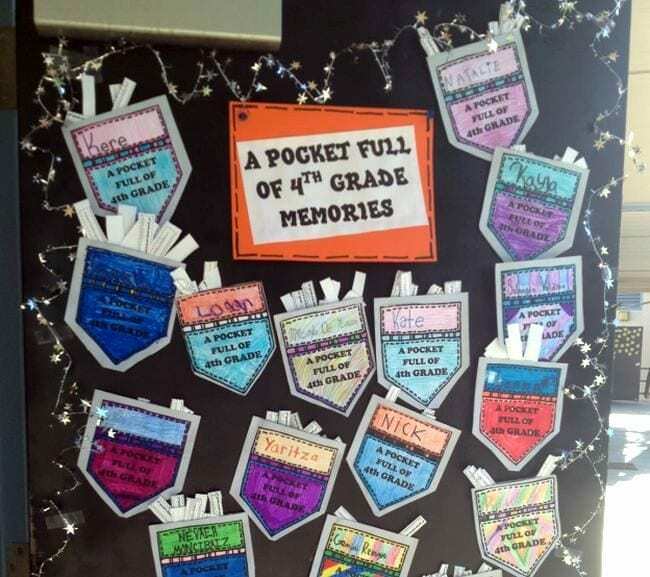 Let each student create a pocket then fill it with slips of paper detailing their favorite memories of days past. Look at all those adorable little students enjoying the world’s longest swing set! We think it’s amazing, and your kids will too. 8. End the year with a bang. 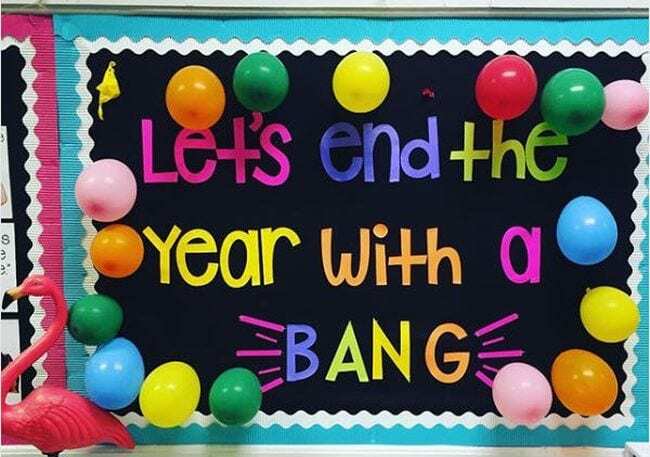 Kids absolutely love this end-of-year bulletin board! Put a student’s name inside each balloon. Pop one each day, then spend the day celebrating that student. You can also fill the balloons with fun activities (have class outside, hold a dance party, etc.). 9. Demonstrate your growth mindset. Flowers that are 3-D really pop, and these are easier to make than you might think (get instructions here). 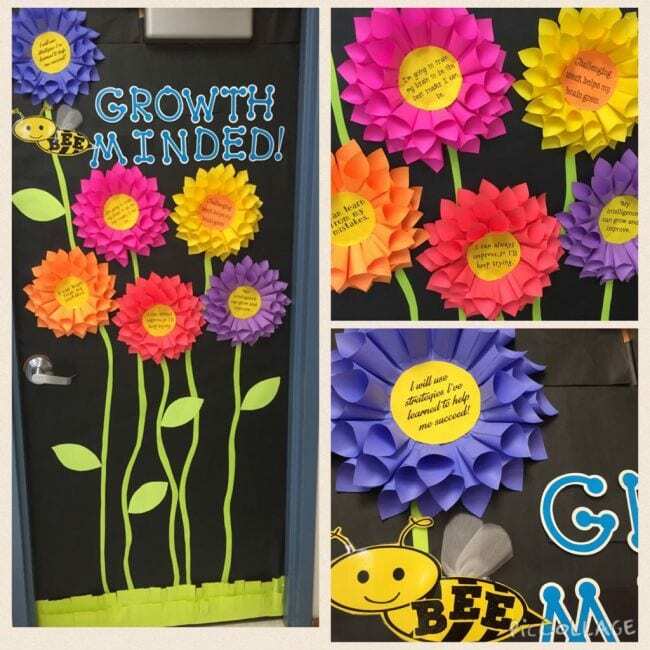 They’re a beautiful way to highlight growth mindset statements. 10. 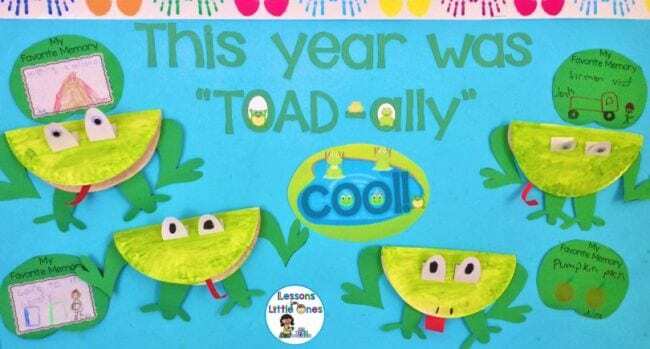 Celebrate your toad-ally awesome year. What’s not to love about these paper-plate frog faces and lily pad memories? Older kids can write more details about their favorite memory inside the frog’s mouth. 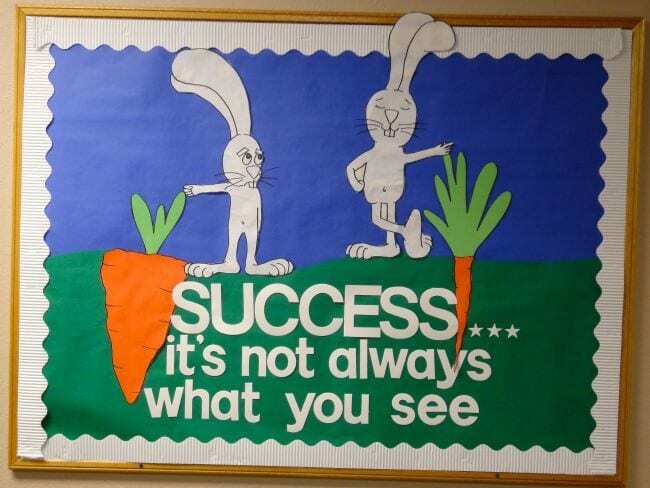 These fun springtime bunnies will remind your kids that there’s more to success than meets the eye. That’s a lesson worth learning all year long. 12. Remind them to bring back their library books. Oh, those end-of-the-year chores! 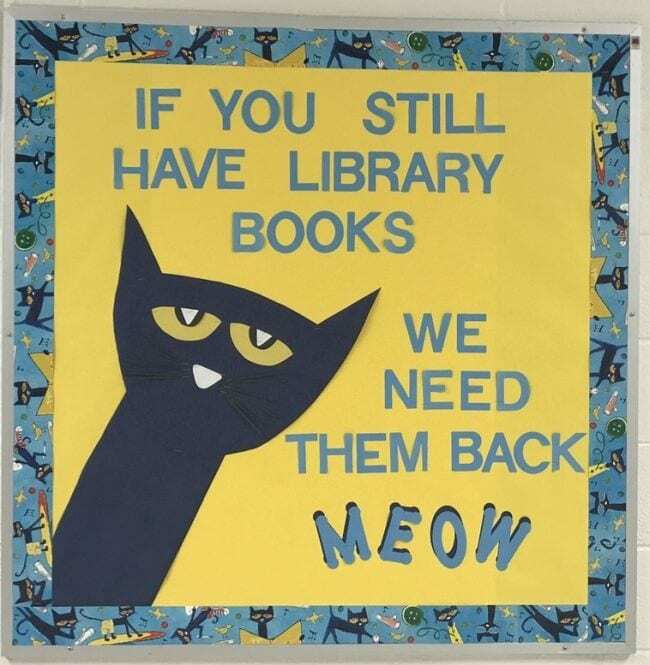 Help kids remember to return any borrowed books before the last day arrives with this clever kitty. 13. Shower them with springtime math. Give new life to the old saying by adding some math facts. Each raindrop holds a fraction, each flower the corresponding decimal. 14. Look up to the adventure ahead. 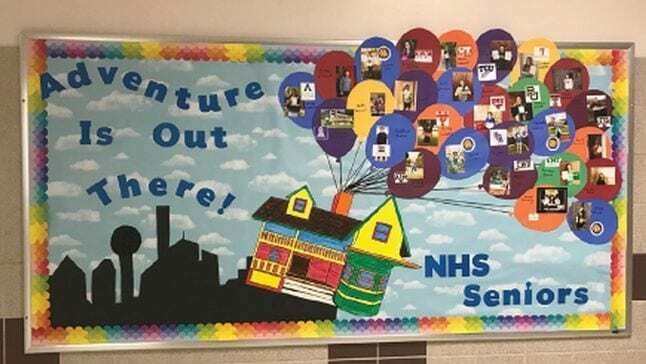 Inspired by the movie Up, this colorful end-of-year bulletin board shares where each student is heading next. Use it for seniors to show their college or work plans or for younger kids to share what they hope to learn in the next grade. 15. “Bee” amazing all spring long. 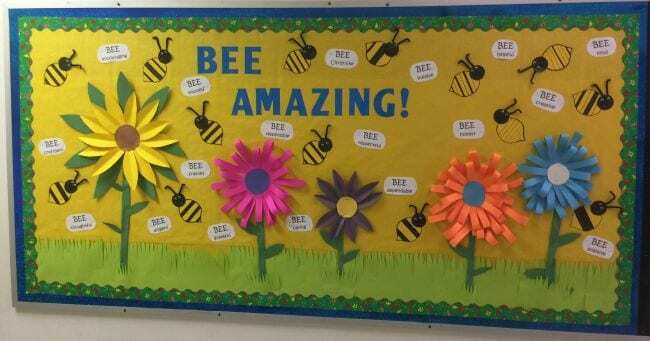 Have your students help you make a list of ways to “bee” amazing. 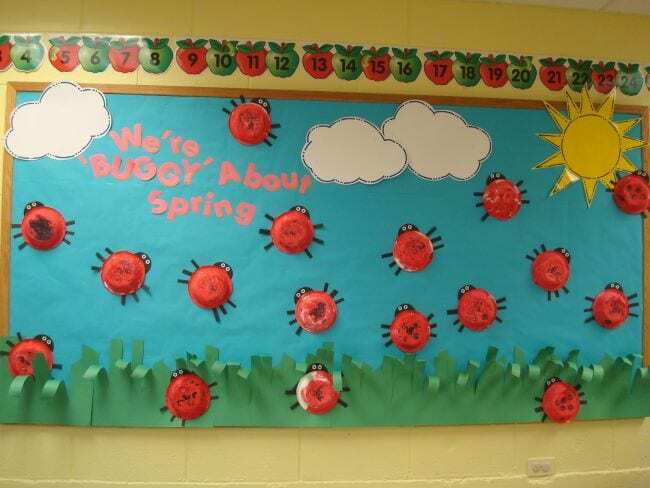 Then create this simple spring bulletin board with eye-catching flowers and happy bees to display their answers. 16. End the year with emojis. 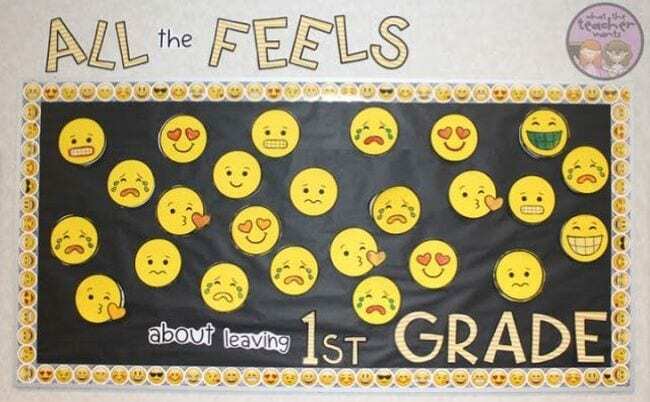 Help kids talk about how they’re feeling now that the end of the year is near. Emojis makes this exercise fun. Have kids choose the one that suits them best, then write about their feelings on the second circle stapled beneath. See more at the link below. 17. 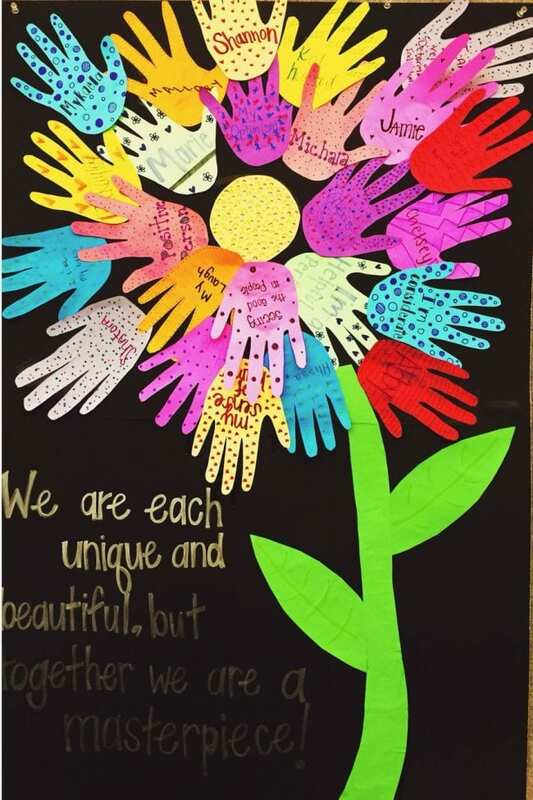 Build a flower of handprints. Trace each student’s hands on colorful paper and have them add decorations. Then use the handprints to create a single spectacular springtime bloom. 18. Swim your way to summer. Be like Dory from Finding Nemo and just keep swimming until you make it to the end! Don’t blame us if you walk around singing that little tune all day, though. 19. Assemble a shower of test tips. For many, spring brings testing season. 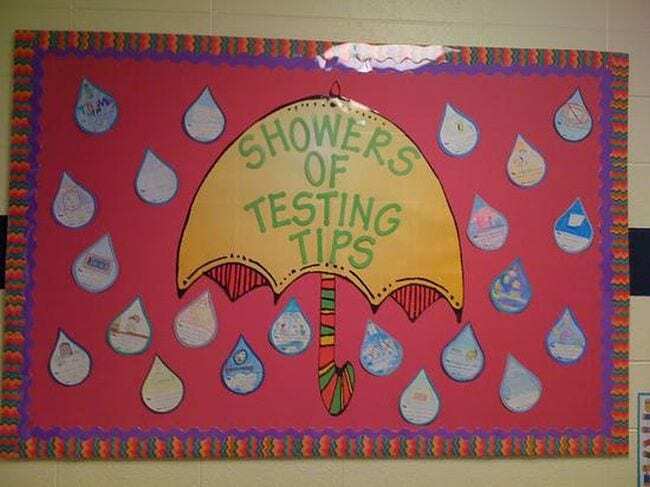 Get kids to share their best tips for staying calm during testing season on individual raindrops and post them for all to see. 20. 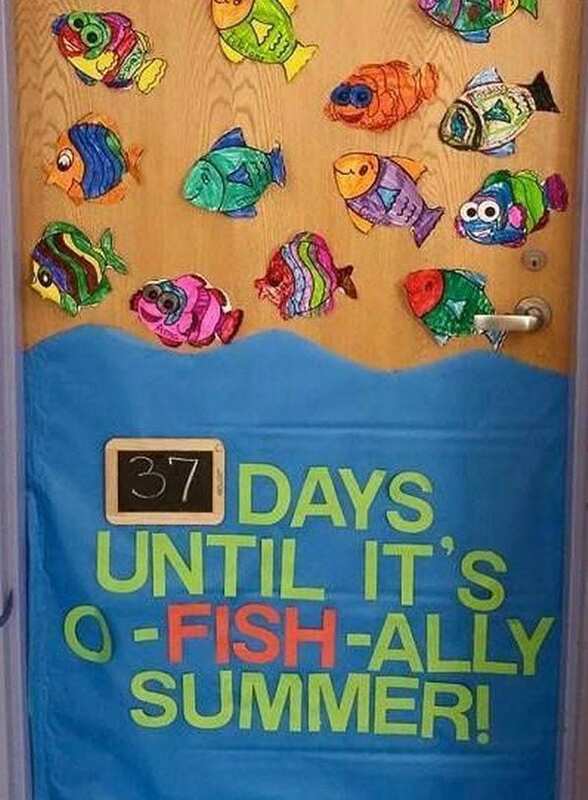 Count down the days til it’s o-“fish”-ally summer. 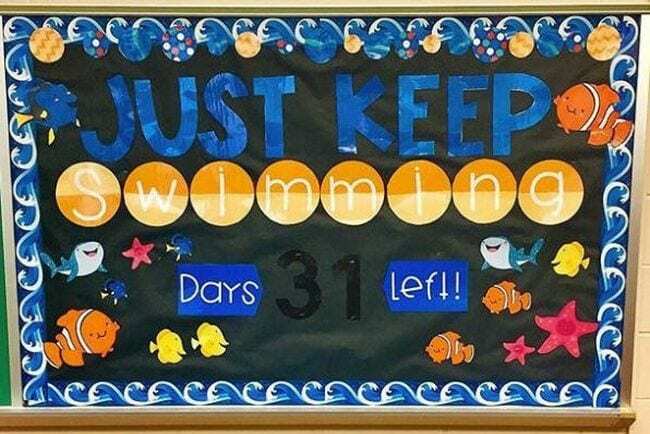 Swim toward summer with this simple but effective end-of-year bulletin board idea. Let the students color in their own fish and help you change the count each day on the mini-blackboard. 21. Spread your wings and fly. 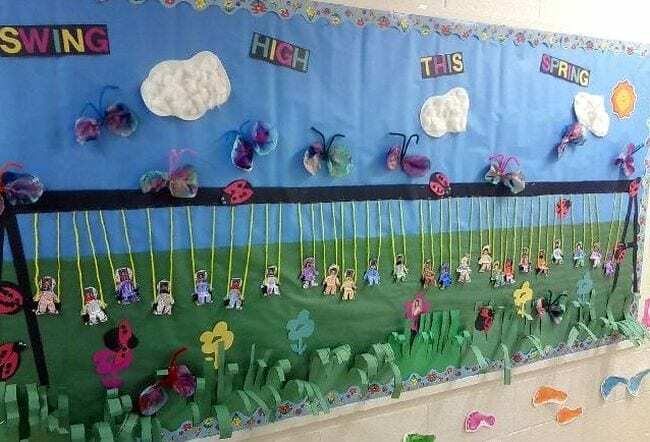 This might take a bit more space than a regular bulletin board, but it’s definitely worth the effort. Made by students, each feather features their hopes, dreams, and wishes for the future. 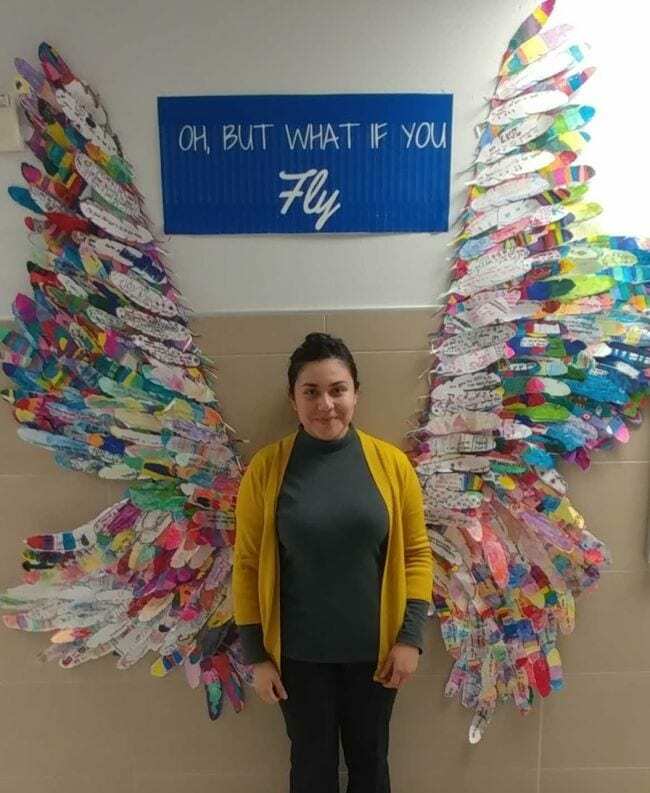 Assemble them into a giant pair of wings so students can pose for social media–worthy photos. 22. Stay on target until the very end. It’s so easy to get distracted as the final school days arrive. 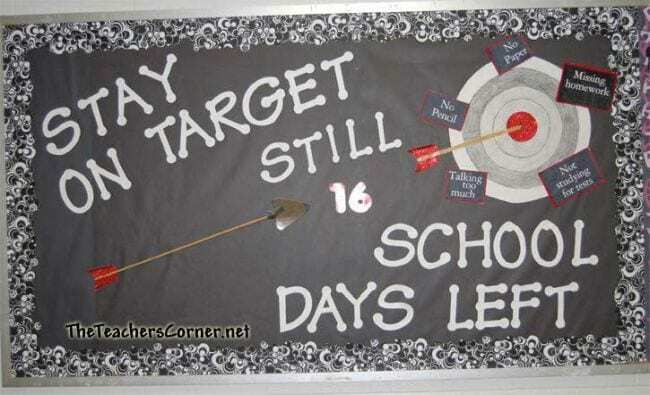 This board reminds kids they still need to do their work and be prepared for class right up until the last day. 23. 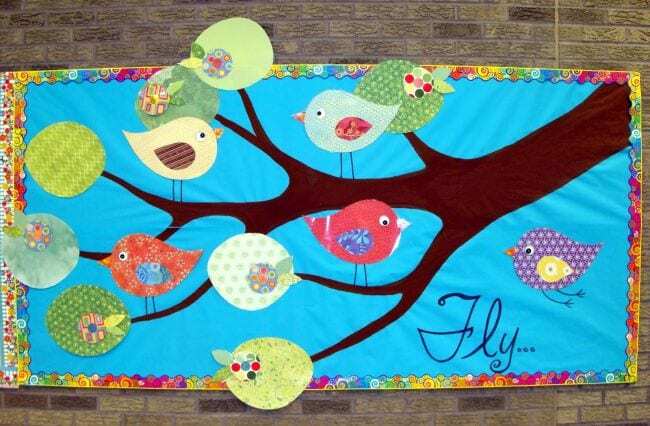 Fly away on spring breezes. funny little feet to complete the scene. 24. Feel the force of approaching summer. 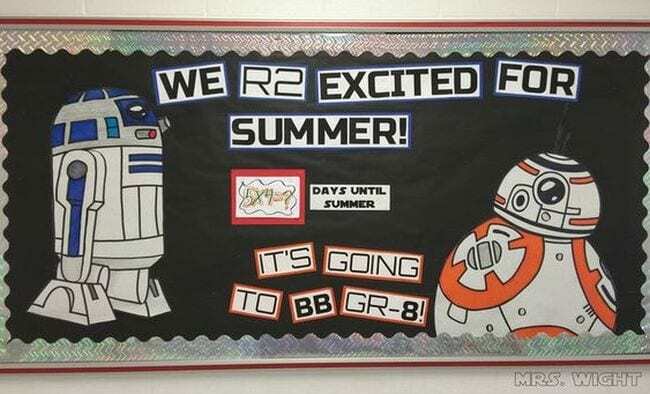 This is definitely one of our favorite end-of-year bulletin boards. We love the math facts in the middle helping to count down the days. 25. Bug out about spring. Paper plate ladybugs are easy to make and look so great on display. You could also make bees by using yellow plates and adding stripes and wings. Or link together multiple plates to create a caterpillar to fit with the bug theme. 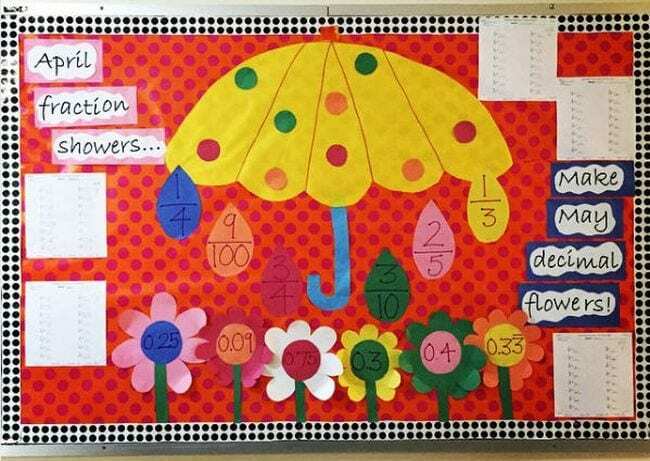 Have more great spring or end-of-year bulletin boards to share? Come and post them in our WeAreTeachers HELPLINE group on Facebook. Plus, 30 End-of-Year Assignments and Activities for Every Grade.